Vector Stone deals directly with quarries and factories all over the world, importing only the finest quality stone available. 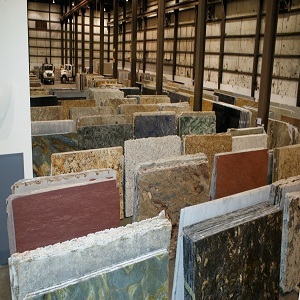 At the Vector Stone warehouse, customers can view over 200 colors of granite and marble slabs in the constantly growing inventory. The inventory includes well known classic colors along with rare exotic stones from various countries. Vector Stone is open to the public, and offers knowledgeable insight to customers to choose the best stone for each project. This includes matching cabinets to complementing slab colors, explaining different types of variations, movements, and color tones, as well as the applications of each stones and finishes. Once the desirable slab has been selected and tagged, Vector Stone will arrange for the slab to be delivered to the fabricator that has been selected by the customer. © 2015 Vector Stone LLC. All rights reserved.